Click HERE to download a 9 page PDF document that will provide detailed information on Muscle RX. This formula now includes a whole food cultured media blend to ensure these nutrients are at their highest and most absorbable state when entering the cells. Chromium has also been added to boost the bodies ability to maintain steady blood sugar levels, while inhibiting the overproduction of Cortisol. Previously, clients sought this extra nutrient (Chromium) through other means like the Fat/Sugar Formula. It is now no longer necessary to take in Chromium from other sources. Optimal MUSCLE Rx uses the only government patented natural formula blend that has been proven to sustain and build muscle as well or better than anabolic steroids like Testosterone. Optimal MUSCLE Rx has been used by professional and amateur athletes, along with patients of health professionals to speed up the body’s ability to build, heal and restore lean muscle tissue. MUSCLE Rx also utilizes 5 individually patented nutrients. The formula is assimilated at the cellular level by a 47 ingredient enzyme based cultured delivery system. To view the full formula patent simply Google “US Patent # 5,888,553”. Muscle Rx - Add that bulk with a healthy approach that includes 3 critical amino acids! The Muscle Rx formula is composed of some of the most powerful, strength increasing and muscle building ingredients ever proven through true clinical trials to help increase anabolism - a patented Creatine Amino Acid Chelate blend, patented stabilized Glutamine (magnesium glycl glutamine) and the branch chain amino acids leucine, isoleucine, and valine. Numerous studies have shown Creatine to improve athletic performance and delay muscle fatigue. The mechanism behind this phenomenom involves Creatine's ability to increase the production of phosphocreatine in the muscle tissue, a needed component for the formation of adenosine triphosphate (ATP). ATP is the muscle's main source of energy and is needed by the body for numerous other functions. Research shows that total creatine and muscle phosphocreatine stores can be increased significantly with Creatine Monohydrate supplementation. Studies indicate that it only takes one hour for a single dose of five grams of creatine to increase creatine plasma levels to a peak, with a return to pre-supplement levels within five hours (Albion Labs). These measures indicate that the serum half-life of creatine is approximately 2 hours, which would give the five grams of creatine supplementation a serum life span of fourteen hours (Albion Labs). Unfortunately, Creatine Monohydrate has also been shown to increase creatinine levels in the body. Excess creatinine has been shown to increase kidney damage and cause other renal problems. In OHS research, blood work from a National Hockey League team was monitored and analyzed through an entire season and a significant increase in creatinine levels was found. The supplement the team routinely utilized was Creatine Monohydrate. Studies show that Creatine Monohydrate in supplemental form may become unstable. Albion Labs found that Creatine Monohydrate has the ability to turn into Creatinine because of this instability. A new form of creatine has been created out of this awareness. Creatine Amino Acid Chelate is a completely stable molecule that, on its own, is much more effective than Creatine Monohydrate. It also helps to enhance the absorption and bioavailability of Creatine Monohydrate. By combining the two creatines, Albion Laboratories found that it intensified their test subjects' ability to generate and regenerate the ATP needed to outperform, by a wide margin, the performance of the test subjects taking Creatine Monohydrate alone (Albion Labs). The additional advantage to this new molecule is that magnesium is one of the binding agents and because of its chelation to Creatine and Glycine, it is much more effective at increasing protein synthesis. Magnesium is necessary for the metabolism and production of ATP. ATP is formed via the Myokinase and the Creatine Phophokinase reactions, which require magnesium to catalyze their energy producing reactions. 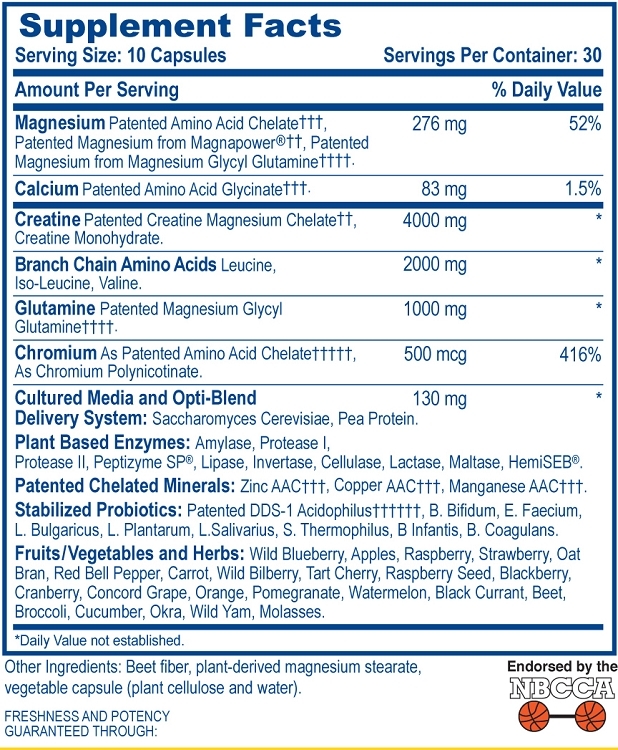 In summary, the presence of magnesium is necessary for creatine to synthesize and regenerate ATP. Albion's Creatine Amino Acid Chelate not only surpass all other creatine compounds for absorption, it is also the safest. Toxicology studies show that ingestion of up to 2,000 mg of Albion's Creatine Amino Acid Chelate per kg body weight (or 164 gm for a 180 lb. man) produced no side effects in animals. Glutamine is an amino acid that plays an important role in promoting muscle protein synthesis, counteracting muscle catabolism, and supporting the immune system. Glutamine also neutralizes acidosis in the intestinal tract, enhances intestinal absorption of nutrients, and can act as an energy source. Skeletal muscle is the primary storage site for glutamine, but glutamine is also found in small amounts in various other locations in the body. Food sources of glutamine include high protein foods such as meat, poultry, fish, beans, and dairy products. The body can also make glutamine. Studies show that the changes in intestinal glutamine metabolism are intimately tied to the needs of the liver for substrates, and particular amino acids, to meet the increased demands for enhanced glucose utilization during exercise. Other research showed that glutamine stimulates the secretion of growth hormones. Growth Hormone levels increased by 430% and remained above baseline levels for more than an hour and a half after ingestion. This study showed that even small levels of Glutamine optimize the stimulation of hGH production in the pituitary gland and cause its prolonged distribution throughout the body. However, strenuous exercise, infection, and trauma can severely deplete the body's glutamine stores and can cause temporary glutamine deficiency. In fact glutamine is critical to the body's ability to create new muscle tissue. It has been called the "non-essential essential amino acid" because of its increasing deficiency in humans. A deficiency in glutamine contributes to muscle wasting, reduced immune response, and decreased multi-organ function. Another important fact about glutamine and muscle growth is that the total pool of muscle free intracellular amino acids consists of 60% glutamine. During catabolic stress, due to exercise or other factors, a marked reduction of over 50% of this glutamine pool occurs. Although it is known that glutamine supports the optimal functioning of vital organs and systems, providing bioavailable glutamine in a supplemental form has always been a problem. The free-form glutamines and L-glutamines available in most health food stores are not stable and decompose readily in the digestive tract and are, therefore, unableto sufficiently provide the benefits listed above except in large dosages and with some possible toxic buildup. OHS colleagues developed and patented the only stabilized form of the glutamine molecule available today. Studies show that the Stabilized Magnesium Glycl Glutamine molecule remains stable in solution and is ready to be assimilated into the mucosal cell. This is the only stabilized glutamine known to be in existence. Its ability alone to increase recovery of the muscle tissue is a phenomenal step forward in being able to build the lean muscle tissue needed to compete and even surpass that of anabolic steroids safely and effectively. The other key factor that is critical for muscle tissue synthesis is Branch Amino Acids (BCAA's). The branch chain amino acids consist of Leucine, lsoleucine, and Valine. These three amino acids make up one third of the muscle intake after exercise. During intense exercise and in conditions of a relative lack of energy, the metabolism of the BCAA's is accelerated in muscle. It has been proven that the administration of BCAA's during short-term and long-term exercise, resulted in significantly greater muscle NH3 and glutamine production, as well as lower lactate production, than is observed during exercise without BCAA supplementation. There are no fillers used in this product. This is important for the serious athlete so that they are not taking in additional unneeded calories from sugar fillers found in most other formulas! Plant Based Enzymes: Amylase, Protease I, Protease II, Peptizyme SP®, Lipase, Invertase, Cellulase, Lactase, Maltase, HemiSEB. Chelated Minerals: Zinc AAC, Copper AAC, Manganese AAC. Stabilized Probiotics: Patented DDS-1 Acidophilus, B. Bifidum, E. Faecium, L. Bulgaricus, L. Plantarum, L.Salivarius, S. Thermophilus, B Infantis, B. Coagulans. For Building Lean Muscle: Take 5 capsules before and after lifting weights, and take 5 capsules morning and night on non-lifting days. For Sustaining Muscle: Take 5 capsules before and after resistance training, and take 5 capsules at night on non-training days.